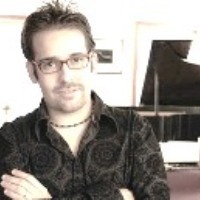 Cuban pianist, bandleader, composer and arranger, Manuel Valera is in the forefront of contemporary modern jazz. He represents the next generation of great performers and composers. His sound is fresh, inviting and evocative, and his goal is to forge innovative sounds that bring a vitality and newness to the idioms of jazz and Latin jazz. He is constantly workshopping musical ideas to develop new composition and arranging techniques that bring together Cuban, Puerto Rican, Brazilian and various jazz styles and forms. Valera is the son of saxophonist Manuel Valera (from the bandstands of Paquito D’Rivera, Chucho Valdes, Gonzalo Rubacabla and Tito Puente). Valera studied at The New School in Manhattan, and by the time he graduated he had started composing, studing under Bill Kirchner, Reggie Workman, George Garzone and Jane Ira Bloom. Valera is a current member of the bands of Arturo Sandoval, Paquito D' Rivera, Dafnis Prieto, Brian Lynch, Samuel Torres and John Benitez. Manuel won second place in the 2004 and 2006 Great American Jazz Competition. Manuel is a recipient of the 2005 and 2006 ASCAP Young Composers Award and a final nominee in the Up & Coming Musician of the Year category of the Jazz Journalists Association Awards. He recieved a commission for the 2007 Chamber Music America New Works Award. Valera's current projects include: a Cuban quartet with drummer Dafnis Prieto, saxophonist Felipe Lamoglia and bassist Charles Flores; and a trio with bassist James Genus and drummer Jeff "Tain" Watts performing music from the upcoming MaxJazz release Currents. Forma Nueva was such a mature work from a player so young that Manuel Valera seemed to have come out of nowhere. In fact, like so many interesting voices on the current jazz scene, he came out of Cuba. But his history is uncharacteristic, because he studied European music and classical saxophone at the Manuel Saumell Conservatory in Havana. Indeed, what made Forma Nueva so fresh was its creative eclecticism. The metric sophistication and urgent energy of Hispanic music was present, in rhythms from Cuba and also from Venezuela and Puerto Rico and Brazil. But the rhythmic content was implicit rather than primary. Valera’s compositions for trio and quartet, and his own piano work, showed he had internalized sources within the great jazz piano tradition (Bill Evans, Wynton Kelly, Oscar Peterson), and also revealed his reverence for and study of composers like Debussy and Ravel. Forma Nueva created a buzz on the street. Valera became busy as a sideman with artists such as Brian Lynch, Dafnis Prieto, Yosvany Terry and John Benitez. But he was committed to pursuing a career as composer and bandleader and within the year he recorded two more albums: his second, Historia (Fresh Sounds New Talent 2005) and his third, Melancolía (MAVO 2006). Thomas Conrad wrote in JazzTimes, “Melancolia verifies that Manuel Valera’s 2004 recording debut, Forma Nueva, was what it seemed: the introduction of a major new talent.” Valera’s recordings continued to explore the trio and quartet formats, and continued to attract the best young players in New York. Melancolia also employed a string quartet on several tracks opening up new vistas of compositional colors and textures across the full range of Valera’s sources, from Rachmaninoff to Silvio Rodriguez and revealing a deepening interpretive sensitivity as a pianist. Vientos is another step forward in Valera’s career as pianist, composer, and bandleader. It represents a new label affiliation; a new working quartet with Joel Frahm, James Genus and Ernesto Simpson, twelve original compositions, a new complementary woodwind quintet ensemble format, an infringement upon the barriers of category to create a new synthesis of jazz, Latin, and European classical musics. Valera discovered his fascination for the “richness and sonority” of this instrumentation in woodwind sections within orchestral pieces by Debussy, Ravel, Stravinsky, and Shostakovich and looked at compositions written specifically for woodwind ensembles, like Elliott Carter’s “Eight Etudes And A Fantasy” for Wind Quartet and Darius Milhaud’s La Cheminée du Roi René. Valera's latest recording—Currents featuring James Genus on bass and Ernesto SImpson on drums—will be released on MaxJazz label in September 2009. The cd is a collection of originals and standards in a trio format.